While some hulls (like powercats, tunnel boats, and stepped hulls) run a bit differently, in most cases, efficient cruising speeds come shortly after getting onto plane. Do you know your boat’s most efficient cruise? It’s surprising how few boaters can tell you, off the top of their head, what cruising speed is the best on their own boat. Truth be told, most of us simply go as fast as conditions allow, without stressing the boat. 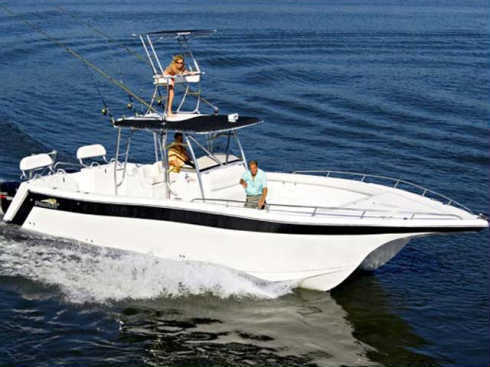 But if you learn where your boat runs most efficiently, you can save a bundle on fuel in the long run. My 22 Glacier Bay, for example, nets 3.5 miles to the gallon at 22 mph, while turning 4000 rpm. If I crank it up to 4800 I can squeeze out 25 mph – but I only get 2.9 miles to the gallon. Is it worth the extra three mph, to be burning so much more fuel? Unless I’m dodging a thunder-head or fishing a tournament, I say no way. If you don’t already know your most efficient cruising speed, you’ll need to bring a paper and pen aboard the next time you leave the dock. Bring the boat onto plane, the set your throttles to the nearest 500 rpm increment. In most cases, this will either be 3000 or 3500 rpm. Record your mph, and gph. Then nudge the throttles up to the next 500 rpm increment. Again, record these figures. Continue doing so, until you reach wide-open throttle. Next, divide mph by gph, to get miles per gallon. Now, at a glimpse, you can see where your boat gets the best mileage – your most efficient cruising speed. In most cases, it’ll come shortly after your boat breaks a plane. But in some cases (powercats, stepped hulls, and tunnel hulls are often a bit different than straight V-hulls) you’ll actually get better fuel economy near the top of the powerband. And in most cases, fast pre-planing and wide-open speeds account for your worst fuel economy. Regularly running at the boat’s “sweet spot” can save you quite a bit of fuel, over the long haul. And in most cases, running at an efficient cruising speed won’t slow you down enough to account for more than a few minutes of fishing time lost. So the next time you point the bow at the horizon, do so knowing your boat’s most efficient cruise.